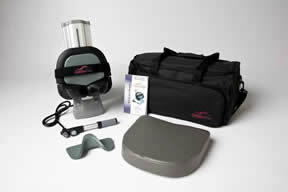 Learn more about the Comfortrac and its treatment options. The ComforTrac Cervical Traction Device is intended to treat a musculoskeletal or neurological impairment of the cervical spine to relieve pain, relax muscle spasms, and decompress spinal structures. Cervical Traction should be avoided in any condition of the cervical spine where movement can aggravate the condition or result in spinal instability, spinal injury and/or nerve root injury at risk for causing paralysis or ischemia. Determine the patient’s body weight. Tension should be up to 7% – 10% of body weight. Instruct the patient to lay supine on the treatment table with the neck between the neck wedges of the cervical traction device. Adjust the neck wedges appropriately so that they are snug around the patient’s neck. If necessary have the patient sit up and adjust the neck wedges and then have the patient lie back down. Cervical traction may be used for acute cervical pain as long as the cervical spine has been cleared for any of the Recommended for Use information mentioned within the General Guidelines section. Traction may also be more beneficial when used with other modalities such as cold, heat, ultrasound, etc. to reduce pain. Initially, apply tension only up to patient tolerance as aggressive stretching of the cervical spine may create muscular spasm and pain in this condition. Cervical traction may be effective in helping to treat Capsulitis of the cervical spine. Be sure that the cervical spine has been cleared for any of the Recommended for Use information mentioned within the General Guidelines section. Traction may also be more beneficial when used with other modalities such as cold, heat, ultrasound, etc. Cervical traction may be used for Radiculopathy as long as the cervical spine has been cleared for any of the Recommended for Use information mentioned within the General Guidelines section. Traction may also be more beneficial when used with other modalities such as cold, heat, ultrasound, etc. Cervical traction may be used for chronic cervical pain as long as the cervical spine has been cleared for any of the Recommended for Use information mentioned within the General Guidelines section. Traction may also be more beneficial when used with other modalities such as cold, heat, ultrasound, etc. Degenerative disc disease (DDD) often leads to radiculopathy and cervical pain. Cervical traction alleviates pressure on the diseased discs to promote decreased pressure on peripheral nerve roots and enhance nutrient delivery to the disc. Be sure that the cervical spine has been cleared for any of the Recommended for Use information mentioned within the General Guidelines section. Traction may also be more beneficial when used with other modalities such as cold, heat, ultrasound, etc. Cervical traction may be effective to increase the mobility of the cervical facet joints as long as the cervical spine has been cleared for any of the Recommended for Use information mentioned within the General Guidelines section. Traction may also be more beneficial when used with other modalities such as cold, heat, ultrasound, etc. A herniated cervical disc often leads to radiculopathy and cervical pain. Cervical traction alleviates pressure on the diseased discs to promote decreased pressure on peripheral nerve roots and enhance nutrient delivery to the disc. Be sure that the cervical spine has been cleared for any of the Recommended for Use information mentioned within the General Guidelines section. Traction may also be more beneficial when used with other modalities such as cold, heat, ultrasound, etc. Cervical traction increases joint mobility of the cervical spine for patients with hypomobility of the cervical spine. Be sure that the cervical spine has been cleared for any of the Recommended for Use information mentioned within the General Guidelines section. Traction may also be more beneficial when used with other modalities such as cold, heat, ultrasound, etc. 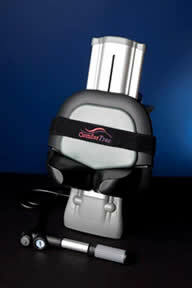 Cervical traction may be effective in helping to relax muscular spasms of the cervical spine. Be sure that the cervical spine has been cleared for any of the Recommended for Use information mentioned within the General Guidelines section. Traction may also be more beneficial when used with other modalities such as cold, heat, ultrasound, etc. Cervical traction may benefit patients with osteoarthritis by promoting increased movement of the cervical spine and decreased pressure on the facet joints. Be sure that the cervical spine has been cleared for any of the Recommended for Use information mentioned within the General Guidelines section. Traction may also be more beneficial when used with other modalities such as cold, heat, ultrasound, etc. Cervical traction effectively reduces radiculopathy resulting from impingement of cervical nerve roots. Be sure that the cervical spine has been cleared for any of the Recommended for Use information mentioned within the General Guidelines section. Traction may also be more beneficial when used with other modalities such as cold, heat, ultrasound, etc. Cervical traction may be an effective for Whiplash as long as the cervical spine has been cleared for any of the Recommended for Use information mentioned within the General Guidelines section. Traction may also be more beneficial when used with other modalities such as cold, heat, ultrasound, etc.